Corporations are paying a smaller share of federal taxes. Sixty-nine percent of Americans say corporations pay too little in taxes , according to a 2015 Gallup poll. But inside Washington, the conversation about reforming business taxes seems to focus on cutting the corporate tax rate as much as possible, rather than ensuring that corporations pay their fair share in a smart, sensible way. If business tax reform reduces tax breaks for corporations, many politicians want to give all of the resulting tax revenue back to corporations in the form of a lower tax rate. This constraint narrows the window of possible outcomes for tax reform to exclude the policy supported by the general public: raising more revenue from corporations. And the American people are not being unreasonable to ask corporations to make a larger contribution, since corporate taxes only contributed 10.6% of total federal revenues in 2015. 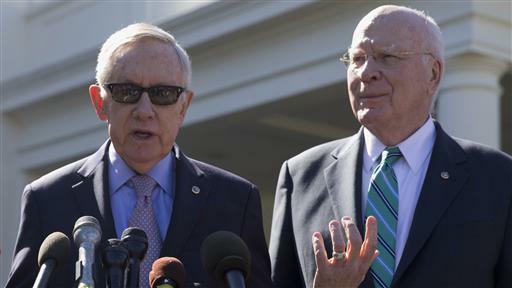 Senate Minority Leader Harry Reid expressed frustration that Senate Republican leaders are refusing to meet with any Supreme Court nominee from President Barack Obama, with the hope of keeping the seat open for a GOP president to fill next year. That is why it’s so important that President Barack Obama’s final budget shifts the debate in the right direction, by calling for business tax reform to raise sufficient new revenue to pay for the tax breaks for businesses that were passed as part of the tax extenders deal in 2015. Progressives should build on this benchmark. Business tax reform should raise revenue to ensure that corporations pay their fair share for public services — including, but not limited to, recent tax breaks — that support the economy, workforce, infrastructure, functioning markets, and national security on which corporations rely for their profits. Obama’s position on business tax reform hasn’t changed, but the situation has. In an earlier budget, Obama set aside a package of proposals that were to be included in a business tax reform that would neither increase nor decrease tax revenues over the long-term. These proposals included many of the business tax breaks that ended up passing as part of the 2015 tax extenders bill with no offsets for their cost, meaning the bill substantially reduced business taxes. Obama’s new budget reflects this new reality by maintaining a consistent position that tax reform should pay for business tax breaks, which now means that new legislation needs to raise revenue to pay for the earlier tax cuts. But the recent business tax breaks are only one example of how the playing field has tilted towards corporations. The share of total national income flowing to corporate profits is near record-high levels — soaring to over $2 trillion per year — while the share of national income going to compensation of employees has fallen. Meanwhile, the corporate tax code contributes a smaller share of total federal revenue than it used to, while taxes on individuals are contributing a larger share of total revenues. According to the nonpartisan Government Accountability Office, the average federal tax rate paid by profitable corporations is about 13% — although this rate varies widely depending on the company and business sector. This is far lower than the 35% corporate tax rate that is in the tax code, due to the large number of tax breaks and tax avoidance strategies used by corporations. A well-designed tax reform should be able to scale back enough tax breaks and loopholes to bring the effective rate and the statutory rate closer together. This would increase overall tax revenues and reduce distortions from the tax code to make the economy more competitive. One major issue to address is the growing number of businesses that avoid the corporate tax code altogether by organizing as pass-through entities, such as partnerships, which receive more favorable tax treatment largely because their profits are passed through to shareholders without being subject to corporate taxes. The proliferation of pass-through entities is one reason why Obama and others use the term business tax reform — to include all types of businesses — rather than corporate tax reform. Tax reform should also crack down on the accounting tricks used by some corporations to artificially shift their profits into foreign tax havens. This practice is so widespread that in 2013, 42% of all foreign profits for U.S. multinational enterprises were booked in five tax havens: Luxembourg, Bermuda, Ireland, The Netherlands, and Switzerland. Some multinationals take further advantage of foreign tax havens via corporate inversions, where the firm’s headquarters moves offshore for tax purposes, and lawmakers can and should take steps immediately to stop this practice. Multinationals using these tactics are able to lower their tax responsibilities and gain a competitive advantage over businesses that only operate in the United States. Obama’s final budget lays down a useful marker to evaluate future frameworks for business tax reform. The business tax breaks that passed at the end of 2015 cost nearly $500 billion over 10 years. This means that on a stand-alone basis, new business tax reform legislation must raise substantial revenue over the long-term in order to maintain the same standard used by Obama. But progressives should expect more from business tax reform. Taxes support infrastructure to enable a market economy, education to develop a productive workforce, research to create new innovation opportunities, and safety net programs to sustain consumer demand. At a time when up to one million struggling families are getting cut off from nutrition assistance , it makes no sense to reform business taxes without requiring big corporations to make a greater contribution to sustain the programs that are fundamental to the American economy and their own bottom line.